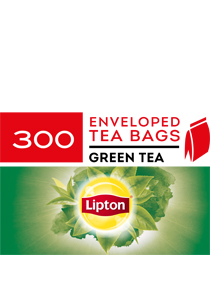 Lipton Green Tea is a delicate, traditional green tea, made by carefully selecting and expertly blending the finest tea leaves from quality tea gardens throughout the world. This is why we can promise you the famous Lipton taste every time. With the foil sealed fresh-pack locking in the tea aroma, the tea smells and tastes so fresh, it is like you have picked it yourself. Comes in a pack of 300 foil envelopes. Ideal for medium and large sized offices. Work can be stressful at times so taking a moment to unwind is important. Having a cup of Lipton can keep your colleagues uplifted and happy. Lipton Green tea will give you a refreshing, invigorating cup any time of the day. The delicate and refreshing taste of green tea brought to you by Lipton.